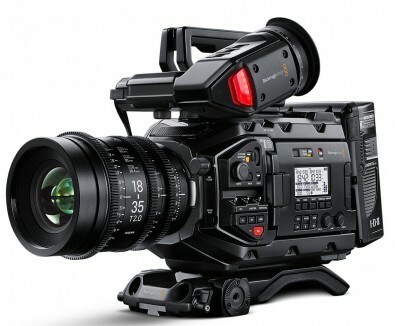 Blackmagic has announced a new flexible URSA Mini Pro camera, suitable for a range of shooting genres from broadcast to film. The camera has a 4.6K sensor with a dynamic range of 15 stops and integral optical ND filters. Interchangeable lens mounts allow for EF, PL and B4 lenses, with Nikon F support coming later this year. The camera has broadcast-style controls but is equally at home with film-style shoots. The Blackmagic Design URSA Mini Pro 4.6K combines digital film technology with the advanced broadcast features and ergonomics, making it versatile enough to be used for broadcast news and live multi camera event production, and affordable enough for indie filmmakers and even students! Yet URSA Mini Pro is powerful enough to be used on feature films and scripted television shows. The URSA Mini Pro has interchangeable lenses mounts, which can be exchanged in the field in a couple of minutes with just a torque screwdriver. The initial release of the camera has a standard Canon EF mount, with options of PL and B4. The camera include a standard Hirose multipin remote for broadcast B4 lenses. The 4.6 K super 35 sensor (4608 x 2592 pxl) has 15 stops of dynamic range and a color space exceeding Rec. 2020. Speed is rated up to 1600 ISO. Frame rates up to 60 fps are supported at 4K, and 120fps with a cropped 2K output. The camera uses CinemaDNG RAW and Apple ProRes codecs with Avid DNxHR in a future release. In 'film' mode a log curve allows the full dynamic range of the sensor to be recorded. The Mini Pro can be fitted with EF or PL mounts for film shoots or B4 for broadcast applications. A shim kit is also available. The built in neutral density (ND) filters also feature IR compensation and are used to quickly reduce the amount of light entering the camera. The 2, 4 and 6 stop filters are specifically designed to match the colorimetry of the camera and provide additional latitude, even under harsh lighting conditions. URSA Mini Pro also features a new interchangeable lens mount that lets you quickly switch between EF, PL and B4 lenses, depending on the type of work you are doing. That means you can work with everything from high quality photographic EF lenses to the largest cinematic PL lenses, and even B4 broadcast HD lenses, all with the same camera. Later in 2017 Blackmagic promises a Nikon F mount with continuous manual aperture adjustment. The URSA Mini Pro fitted with optional shoulder mount and viewfinder. The optional electronic viewfinder and shoulder mount kit lets you go from tripod to handheld shooting in seconds, or you can turn URSA Mini Pro into a live production camera by adding an URSA Studio Viewfinder. The camera records to C-Fast 2.0 and UHS-II SD cards with dual slots for each format. The CFast cardsare used for full resolution, lossless 12-bit RAW recording, with smaller and low cost SD cards for 4K ProRes or RAW HD. With the dual slots, when one card is full, recording automatically continues onto the next card to keep shooting. 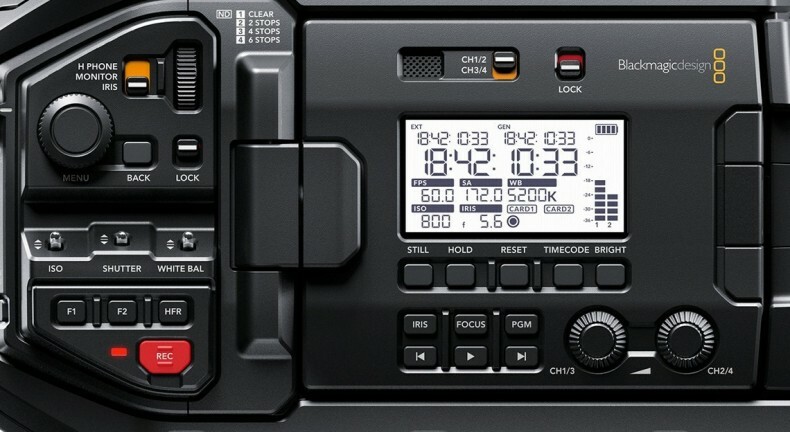 Interconnections include 12G-SDI out, plus reference/timecode in for live productions. Camera power is via 12V 4-pin XLR or regular battery plates from manufacturers such as IDX, Frezzi, Anton Bauer, or the Blackmagic URSA VLock Battery Plate.